I haven’t been posting on Ephemeral Pleasures lately because the household of ephemeral pleasure has been preoccupied with buying a car, and then a large portion of the budget for ephemeral pleasures has been temporarily diverted to the costs associated with buying and operating a car. Fortunately, I had cleverly invested in a lot of theatre tickets beforehand, so there are still events to look forward to without second-guessing the expense, including the rest of the Citadel season. And I still have a small backlog of entertainment and adventures to report on, which I will get on with soon. It’s been a long time since I’d owned a car. When I moved to Edmonton, people in my previous hometown as well as here said “well, you can’t live in Edmonton without a car…” and that sounded like a challenge, so I said “Just watch me.” I’ve lived a mostly-comfortable life in Edmonton for almost five years without a car, thanks to Edmonton Bike Commuters, Edmonton Public Transit, Yellow Cab, Budget Rent-a-Car Southside, and my friends who have given me many rides. I even played a season of hockey, after finding a teammate who was willing to pick me up and take me home. But having a car is like … You know the video game Civilization, where the grid map is concealed in shadows until you explore each tile? And then it opens up, so that you have the feeling that the geography was always there, just never seen, and it changes your whole perspective? It’s like that. My mental map of Edmonton is opening up more and more from my initial tiles of Whyte Avenue and Downtown. All kinds of explorations suddenly become feasible, or at least feasible in the right weather. I’m even starting to get to know other parts of Central Alberta – I’ve explored Fort Saskatchewan and Vegreville and some of the villages on Highway 14, and I can see lots more nearby places on the map that I’m looking forward to checking out. That is, after it stops snowing. This entry was posted in Exploring Edmonton and tagged driving, road trip on March 17, 2013 by Ephemeral Pleasures. One of the ways a new city starts to feel like home is noticing all the ways it’s changed since I arrived. When I lived in Kingston, a small city in eastern Ontario, a lot of people in our downtown and old-society social circles used to give directions by the traffic circle (that’s Upper-Canadian dialect for roundabout) that hadn’t existed since the 1970s, and used to call restaurants by names that weren’t on the sign. It felt exclusive to those of us who weren’t “old stones” (people whose roots were elsewhere), but after several years I found myself also talking about the traffic circle, the place where the beer store used to be, and so on..
And now I find myself doing the same thing in Edmonton. I’ve lived in one place for four years, and spent most of my time in the Strathcona/University neighbourhoods. So I’ve been here long enough to see some changes. Transit When I arrived there were eleven LRT stops and now there are fifteen. The opening of South Campus station rearranged some bus routes, so that I used to take the #6 downtown and now I take the #7. Although lately I’ve gotten so annoyed with watching three #8s go by first that to go home from downtown I don’t wait at the Telus plaza for a bus; I take the LRT to the university and home from there instead. (MasterMaq discussed this problem in a recent blog entry.) The LRT extension north by the Kingsway seems to be really happening, and the next lines have gotten as far as having station names. Restaurants Pad Thai is gone. ouSia opened and I still haven’t gotten around to going there. A crepe place popped up on Whyte Avenue and went away again. Langano Skies closed for renovations after the building fire, but is back. A noodles place across the road changed hands and is now Naanalicious. Four cupcakes places opened in Strathcona/Garneau. Death by Chocolate closed and eventually a Dairy Queen opened. A Funky Pickle outlet near U of A campus closed, but a Papa John’s opened. Cargo and James tea disappeared. Chili’s became O2. Bars come and go, often too fast for me to visit. The Savoy became the Gin Mill became Tilted Kilt, and I hadn’t been to any of them. The Iron Horse sat empty for ages, but didn’t wait for me to become a billionaire philanthropist and buy it to run a passenger- train line to Calgary – it became MKT. I think there was a live-music bar on the north side of Whyte Avenue which is now some kind of billiards-themed place. On 124 Street, d’Lish opened and closed, and now there’s something new there but I haven’t gotten there yet. Downtown, I can’t remember what’s new since I arrived and what I was just slow to discover because I barely crossed the river my first couple of winters here – Zinc opened since I got here, and Underground is new. La Poutine opened in the Garneau Cinema block – oh, and that reminds me. Entertainment The Garneau Cinema is now the Metro cinema. I haven’t been there yet. I think the Metro cinema used to be in Ziegler Hall at the Citadel, but now Rapid Fire/Theatresports is there. It used to be at the Varscona Theatre. The Muttart Conservatory was closed for renovations when I got here, and I think the Art Gallery of Alberta was being rebuilt then too. The Oilers still play at Rexall Place, except that they’re not playing. The baseball team that played in Rossdale folded and there might be a new one. Driving I was here before the big construction project that had 99 Street closed all last summer, I figured out how to work around that, and then it all opened again. I don’t drive often enough to be confident on road directions farther away, but it seems like every time I drive to IKEA, the route changes, the exit to 23rd Avenue looks different, and the sprawl of South Edmonton Common shopping district has gotten bigger. I also think that Fox Drive and nearby routes have been under construction the whole time I’ve lived here. Stores Two record stores have closed on Whyte Avenue, Southside Sound and the big one I forget the name of, and Permanent Records opened on Gateway. Alternative Video Spot moved and became Videodrome. Urban Knitter opened on Whyte Avenue, moved to Gateway, and closed. Ewe Asked for It and Knit and Purl closed. River City Yarns opened a second location and moved its first location. Greenwoods Books moved back to Whyte Avenue (it’s the one store I knew about from before I moved here), and then closed. Earth’s General Store moved from a central upstairs location on the busy part of Whyte Avenue to a bigger place with parking farther away from the crowds. Lucid Lifestyle moved from a storefront to a pop-up kiosk to a different storefront. Blush Lane Organic Market and other interesting outlets opened in a new building where Pad Thai’s parking lot used to be. A Shell gas station closed on Whyte Avenue. It looks like some progress was made on remediating the other gas-station site on Whyte by 106. A Vespa-scooter dealer with bar closed. I think Blockbuster Video closed, but I haven’t checked. The Shoppers Drug Mart at Whyte and 109 moved across the road to a bigger two-story space, and the old space sits mostly empty. Home Depot just south of Strathcona doesn’t have a Harvey’s in its lobby any more; just more things to buy. Scottish Imports moved from Whyte Avenue to 124 Street just when I was becoming aware of 124 Street as a destination. My hairdresser (Mousy Brown’s), on 124 Street, opened a second location in Old Strathcona. And now I’m one of those people who call things by their old names, because I just learned about Treestone Bakery around the time it was changing hands and becoming Boulangerie Bonjour. While some of these specific changes make me sad, I love living in a city that’s prosperous enough that I can look forward to new ventures, and that’s big enough that I still have lots and lots to explore beyond the fifteen blocks of Whyte Avenue I’ve gotten to know. What Edmonton changes make you happy? Which ones make you sad? This entry was posted in Drink, Exploring Edmonton, Food and tagged edmonton, edmonton changes, restaurant, shopping, transit on November 20, 2012 by Ephemeral Pleasures. Last year I started a project to visit all 17 branches of Edmonton Public Libraries, having only seen my local branch and the downtown one. I visited six more, but I only ever got around to writing up four of the visits – and I can’t find the pictures I took on those visits either. 7. Lois Hole Library is a large brand-new facility set in a huge parking lot in parkland in the west end in the Callingwood neighbourhood (which, as far as I can tell, is pronounced exactly the same as the Ontario town of Collingwood). It’s modern and attractive and spacious, with the kind of high-ceilinged plate-glass foyer that feels like a new arena complex. That part of town is one of the ones that reminds me a lot of Mississauga, meaning that it was probably developed in the 1970s. On this visit I ended up explaining to a library employee what I was doing, because I was showing her the bizarre phenomenon of having two checked-out books (different titles by the same author) which the bar-codes thought were actually one copy of one book. She noticed that I was having my holds sent to Strathcona so she offered to fix it, which is why I had to explain. I went there one Saturday last fall when I had a rented car. 8. Woodcroft Library is a small branch across the road from the Westmount shopping centre. I went there by bus, when I had time to spare doing some other errands north of the river. I don’t remember what I borrowed from that branch; I do remember a nice display of the pro-library campaign signs and buttons that they were inviting people to display during the municipal election. That brings us to this weekend. On Saturday I pulled over to the side of the road on my way back from Namao (the base) when it looked like I was probably within a developed enough area to find a library. I used the EPL application on my iphone to find the closest library (I just love that concept!) and it directed me to Londonderry. 9. Londonderry Library is actually in the basement of a shopping mall. Despite its low ceilings and lack of natural light, they’ve done a good job with white walls and angled low bookshelves to make it look inviting. The kids’ section and a little bit of browsing space are upstairs at ground/shopping level. Although there isn’t much study/lounge space, the collection is about double the size of that at my home branch. So now I’ve been to more than half of the current branches (two new branches and two re-builds are planned, and one re-build is under way) . Some of the others I’ll need to visit on weekends when I have a car, but there are still a few that are feasible by bus. And the weekend visiting is easier than it used to be, because now all the branches are open on Sundays except in summertime. 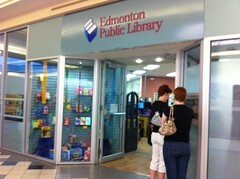 This entry was posted in Books, Exploring Edmonton and tagged library on August 27, 2011 by Ephemeral Pleasures. 5. Capilano Branch. To get to this library, I took the #4 bus that I always take home from work, and continued to the east end of the line. The Capilano Mall looks promising from the outside, I’d always thought when riding by it in a car, but I probably wouldn’t go there again, with Bonnie Doon closer and Southgate now on the LRT. The library is on the small second floor of the mall, across from the elevator. I didn’t see an escalator or a staircase. The returns are in a slot outside. A library staff member sits at a desk facing the door welcoming people. The branch is quite small, and it’s in a space without inherent charm. It’s telling that the webpage on this branch doesn’t mention the collection size, but does mention that the armchairs are full by mid-morning. I’d call this my least favourite of the Edmonton libraries, so far. 6. Whitemud Crossing. This is a big and very busy branch library, one of the ones that’s open on Sundays in winter. It’s in a new-looking block of shops just south of Whitemud Drive, and is easy to get to by car and to park. They have a good-sized section for science fiction and fantasy, automated return checkin machines, and a lot of magazines arranged by theme. (Curve and Ebony don’t count as “Women’s” magazines, but decorating-lifestyle magazines do.) With high ceilings and windows on two sides, the facility was surprisingly noisy, but since I was just browsing that didn’t bother me. I’d definitely go back if I had a car and wanted a change of scene. This entry was posted in Exploring Edmonton and tagged libraries on June 26, 2010 by Ephemeral Pleasures. The Edmonton Public Library has 17 locations. (It hasn’t had bookmobiles since 1995, though). Before this week I had been to two, Strathcona and the downtown one. Now I have been to four. Idylwylde is a branch library in the north end of the Bonnie Doon mall parking lot, in the same building as a Health Unit. While it was being renovated last year the library was somewhere in the mall, but I never got around to visiting it then. From the outside, I noticed a wall of big windows that had the word for Library written across them in many languages, and I could vaguely see books through the windows. It turned out that there were shelves of manga and other graphic novels attached across the inside of the glass – an appealing presentation. There was a gas fireplace and armchairs, computer carrels, a bigger teen section than small-children’s section, a staff-picks display and a 1-week-borrowing display but no other theme displays or new-books section that I could see. I took a picture but my home internet is misbehaving and the tethering connection is insufficient. The Kingston Frontenac Public Libraries also has 17 branches, because it doesn’t just cover the small city but the whole county, some of which is quite rural or on islands. Some of the branches are tiny and open as little as four hours a week. The last year I lived there, I started a project to visit all the branches, but I only got to four or five. So I think I will do it here instead. This entry was posted in Exploring Edmonton and tagged libraries on June 7, 2010 by Ephemeral Pleasures.